Advantages: Bi-lingual text; decal sheet included for 1/72, 1/48 and 1/32 scale models; good coverage of the Wildcat in service; includes excellent colour profiles and scrap view drawings; lots of plans in 1/72, 1/48 and 1/32 scales; very helpful progressive variant diagrams. The F4F Wildcat is the subject for Kagero's latest Monograph publication. This A4 sized title has 128 pages printed on glossy paper between cardboard covers, plus several A3 fold out pages with 1/32 scale plans.. The book is presented in typical Kagero style. The left hand column is printed in Polish and the right hand column in English. The captions and colour artwork receive a similar approach with the Polish language first followed by the English translation. Some of the English text is a bit quirky in grammar and choice of words, but it is certainly readable. 33 pages of the book are devoted to technical drawings. There are 1/48 and 1/72 scale drawings supplemented with larger scrap views detailing specific parts of interest. These are all very well done. In addition to these, though, Kagero includes a series of drawings that point out the specific differences between Wildcat variants. The distinguishing factors are illustrated with shading and in text form, for both US and British variants. I found this feature especially useful. Eight pages of attractive colour profiles, plus six pages of colour walkaround photos round out this publication. A decal sheet is also included with the book. The decals are in 1/72, 1/48 and 1/32 scales and are printed by Techmod. 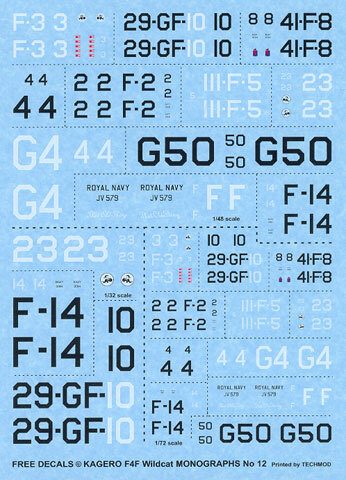 Markings are offered for ten different aircraft, although not all aircraft are provided in each scale. The decal sheet is thoughtfully packed into a sealed plastic bag. With Tamiya's excellent kit, the Just Planes F4F-3 conversion, Sword's late Wildcat, all in 1/48 scale; plus the 1/32 scale Trumpeter kit and the selection of available models in 1/72 scale, there are plenty of subjects to test out your new found knowledge from this book. Kagero's Monograph series is proving itself to be a very useful format for modellers. 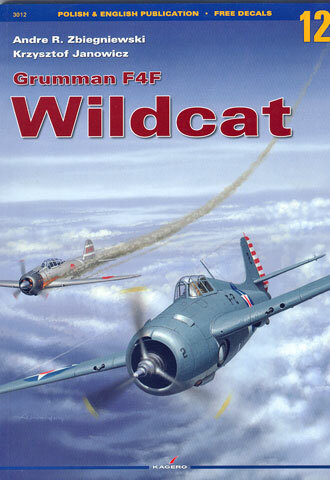 This is an excellent one-stop modellers' reference source on the Grumman F4F Wildcat..